Flea bites are a common cause for a dog's itchy skin. Flea saliva gets under the dog's skin, which causes the itching, scratching and inflammation, according to Stop Dog Itching. 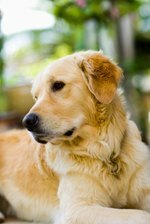 Some dogs are allergic to fleabites and this will make the itching worse than normal. Commercial products found in retail stores for the relief of itching caused by flea bites are expensive. However, natural home remedies will give your dog some relief and are affordable. Give your dog a cold bath to relieve the itching--the hot spots will cool down and reduce itching. Hot baths will only cause the inflammation to swell and cause more itching. Bathe the dog in cornstarch and water to relieve itching or sprinkle some cornstarch on the flea bites, which will temporarily relieve itching. Dissolve two aspirins in 1 tbsp. of rubbing alcohol. Get 1 cup of warm water and dip any flavor tea bag in it. Mix the two mixtures together and let them completely cool down. Shave the area where the flea bites are (if there is a lot of hair) and use a cotton ball to apply the mixture directly to the bites. Use this remedy as often as needed. For flea bites around the feet and ankle area, make an Epsom salt bath. Run a cold bath with enough water to cover the dog's feet and ankles. Add at least 6 tbsp. of Epsom salt and mix well. Make sure the dog does not drink the water, as this will make him sick. Allow the dog to soak in the Epsom salt bath for at least 15 minutes to relieve the itching. Sprinkle baking soda all over the dog if he has a lot of flea bites. For minimal bites, make a paste with water and baking soda. Apply the paste directly to the bites to relieve the itching. Tea tree oil is available at health food stores and a few retail stores. Mix this oil with water (use a 9:1 water to oil ratio) in a spray bottle. Shake the bottle well and spray all over the dog. Do not get this in its eyes, as it might burn. This remedy will relieve the dog from itching for about eight to 10 hours.